photo upload photo upload (required)I understand after checkout I submit an enquiry in my orders and attach a photo. photo upload (required)I understand after checkout I submit an enquiry in my orders and attach a photo. photo upload (required)I understand after checkout I submit an enquiry in my orders and attach a photo. photo upload (required)I understand after checkout I submit an enquiry in my orders and attach a photo. Personalise a bag with your child's drawing to create a unique and magical gift. 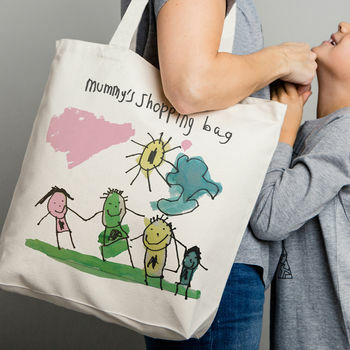 A thoughtful keepsake from the little ones and a great way to capture and treasure your children's drawings. 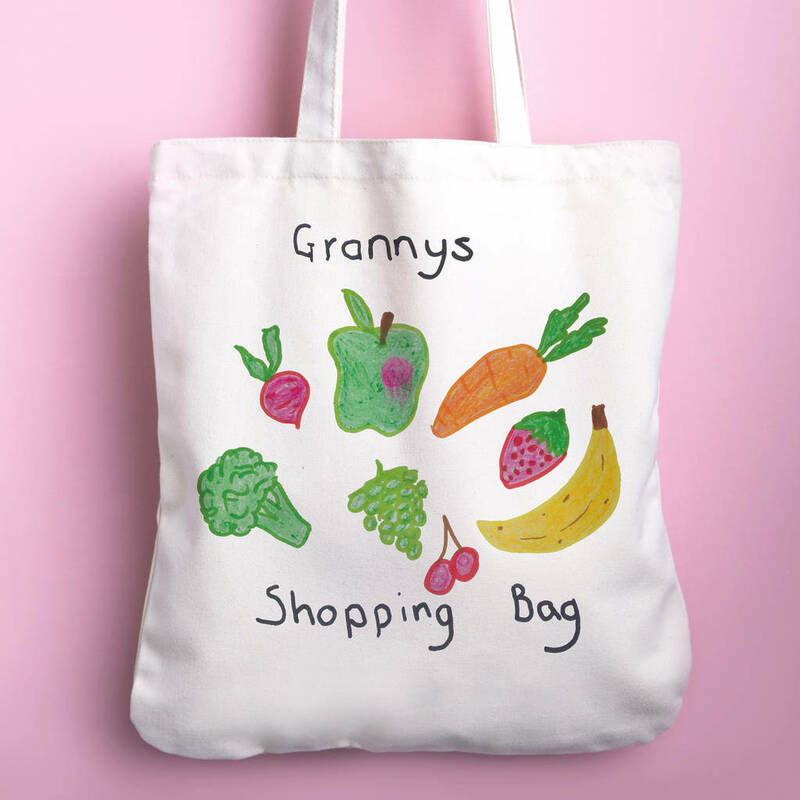 Perfect for proud mums and grandmothers. 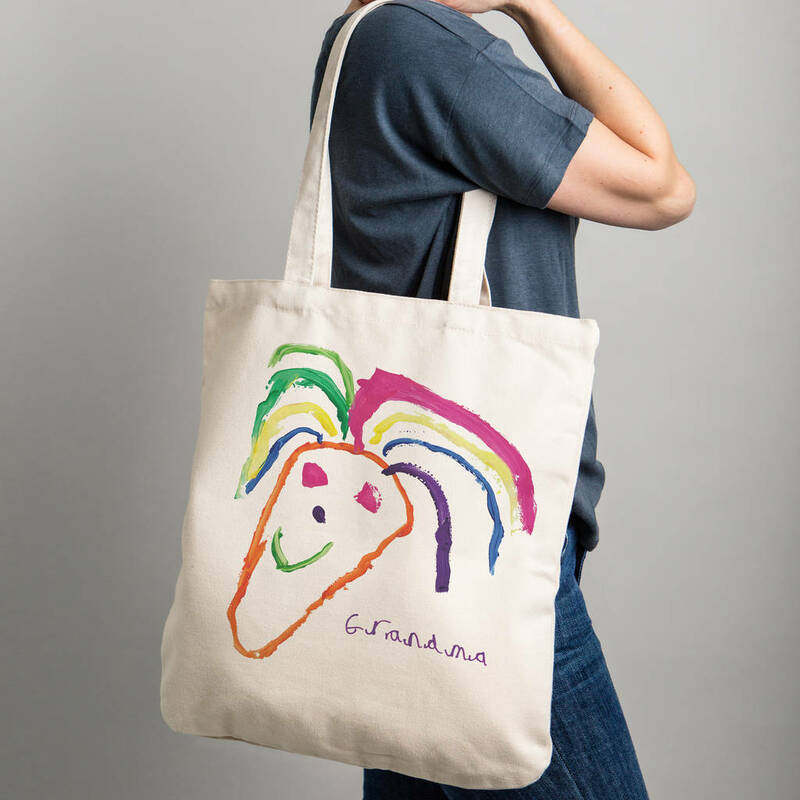 This cotton canvas shopper is really strong and practical for everyday use. Makes a great shopping bag. Can also have an extra print on the other side. Simply choose from a selection of drawings stuck on the fridge or get the little ones scribbling. Tablet drawing apps are ideal, if on paper - a drawing should be on smooth white paper. Bold drawings print best - can be in pen, crayon, felt tip, paint... almost anything! I'm happy to answer any questions or preview a drawing if you are not sure. How to send your image; upload your picture after purchase by logging into your account > my orders > order enquiry and attach your photo. Scanning your image on a printer gives the best image, or a good quality smartphone/camera photo. Some tips; make sure the camera is square on to the picture, and taken in good light with no flash or shadows. 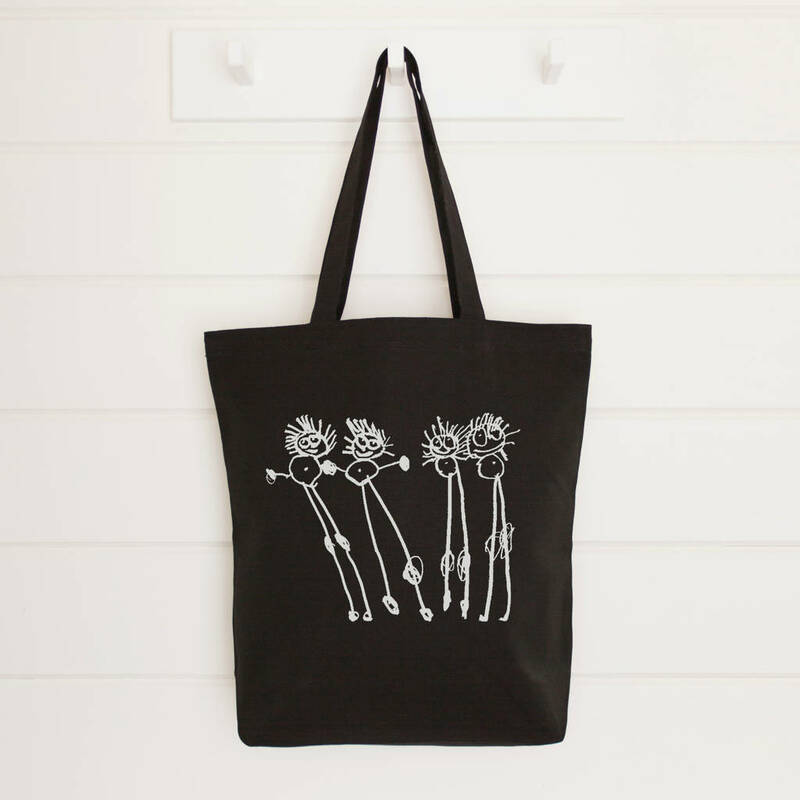 These bags are 100% organic cotton. Image is printed into the fabric using water based inks, resistant to wear and washing. 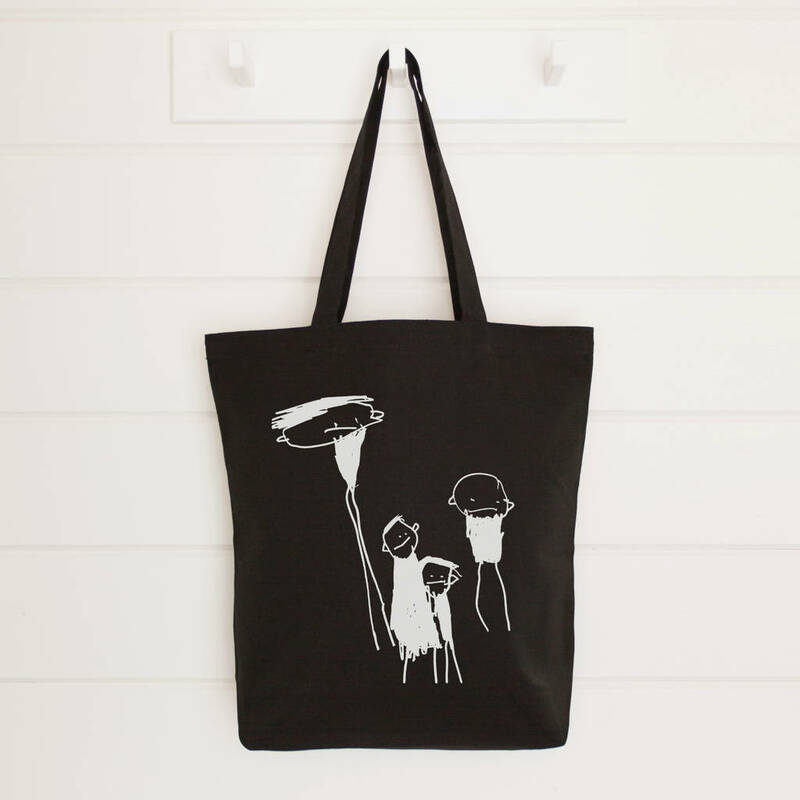 Black bags can be printed in white ink only, I can convert artwork to print. 38 cm x 41 cms. Handle length 63 cm. Capacity 10 litres. This product is dispatched to you by lukedrewthis.